My favorite thing about Christmas in Wizard101is the yuletide pack. My favorite thing is, the christmas furniture and the yuletide pack and the pet those are so cute. The 12 Days of the Spiral is my favorite thing about Wizard101 Christmas. My favorite thing about Christmas in Wizard101 is the community and decorations because it feels happier. I also love the 12 days as well as the yuletide packs. I enjoy the packs that are in the crown shop and the Christmas mounts they have. Never won before hope I win this one! Good Luck to everyone! I love all the decorations placed in the commons! Decorating house for Christmas, farming for Christmas stuff in Wizard101. My favorite thing about Christmas in Wizard is the decoration, it makes it so beautiful and amazing time to see the lights, tree, and decorations. My favorite thing about Christmas is watching my kids eyes light up Christmas day, watching them open their presents. The joy of giving. My favorite part of Christmas in Wizard101 are the decorations! My favorite thing about Christmas in Wizard101 is getting to spend it with friends all over the world. Merry Christmas and Happy Holidays to all! My favorite thing about Christmas in wizard101 is honestly the 12 days of christmas thing that kingsisle does for us. it's always a nice surprise. My favorite thing in Wizard101 about Christmas is decorating my house! Favorite thing about Christmas is a break from AP classes. 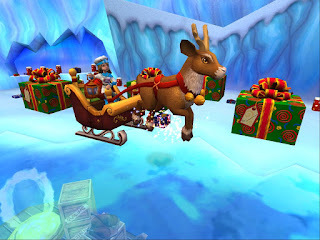 My favorite thing about Christmas in Wizard101 would be the Yuletide pack coming back. Mt favorite thing about Christmas in Wizard101 are the Crowns Shop items! There is always something interesting to purchase! My favorite thing in wizard101 is the happiness and magical Christmas who each wizard have! My favorite part is seeing all the decorations everyone used to decorate their homes! My favorite thing about Christmas on Wiz is snagging snow piles from the bazaar. My favorite thing about Christmas in Wizard101 s having an excuse to ride around on my Charity Falalalallama! My favorite parts of Christmas in Wizard101 are the nostalgic christmas tree and the awesome Santa oufit! My favorite part of Christmas on Wizard101 is that I get to actually celebrate the holiday. I don't normally get to in real life, and I enjoy being able to in my favorite game's atmosphere. I also enjoy the new addition of Christmas music from last year. Really helps to bring in that Christmas Spirit! My favorite thing about holidays in-game are that the Spiral tends to be desolate on Christmas Day. Either way, I love to go blow off zombie heads whenever possible, and that's what I tend to do this time of year.. I like the change in decorations in the Wizard101 and the overall Christmas spirit atmosphere among the wiz fansites. I like the new winterland pack! so many goodies! My favorite thing about Christmas in Wiz101 are all the decorations, awesome activities put on by CM's, and new content. My favorite thing about Christmas in Wizard101 is getting new holiday housing items! Thanks for the giveaway! My favorite thing about christmas is the weather! My favorite thing about Christmas staying with my family and being grateful for many things like Wizard101. My favorite thing about Christmas is the high temps we are having! I love all the cool and colorful decorations! My favorite thing is the house i just decorated for Christmas in Wizard101!